Ashfield is an unfashionable suburb in Sydney’s fashionable inner-west. Unlike neighbouring Summer Hill and Haberfield, it does not have a cluster of cafes and boutique restaurants, nor does it appear in glamorous real estate pages. Its attractions are more functional – a busy station with express and local trains taking around 20 minutes to Sydney's CBD, and numerous cheap-to-rent apartments alongside more solidly middle-class, traditional Federation houses and newer landscaped townhouse complexes. With a predominantly Anglo-Celtic population pre-World War II, Ashfield was both a green escape from the industrial grime of inner-city Sydney and a working-class suburb with plenty of jobs at the now closed biscuit and electronics factories. Added to this economic mix are Ashfield’s layers of migration, beginning in the 1950s and 1960s with the arrival of Italians, Greeks and Poles who were joined a decade later by Lebanese and Turkish people. Since the late 1980s the most rapid influx has been of Chinese, mainly students allowed to stay after the Tiananmen Square massacre, who then brought out their families via the family reunion program. The 2001 census shows that 42.6 % of Ashfield’s 40,000 residents, 76% of whom are Australian citizens, were born overseas, with 7.7% from China, 5.9% Italy and 3.1%, the UK. The arrival of the Chinese has been particularly contentious because their main occupation makes them so visible. No longer is Ashfield’s high street, Liverpool Road, a mix of shops; 85% are now Chinese small businesses, mainly restaurants and small supermarkets. 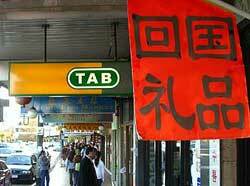 Shanghainese dominate, Ashfield in fact being known as Little Shanghai among the Chinese community. I worked in Hong Kong in the 1980s and travelled widely in South- and North-East Asia. I live in Ashfield and enjoy its diversity and vibrant streets. I like the fact that it was home to 19th century Chinese businessman Quong Tart (and that through working with a Scottish store owner he picked up the accent and a love of Robbie Burns). And while I know some local residents initially resented the conversion of the dilapidated Freemasons Hall into a Chinese temple, unusually combining Buddhism, Taoism and Confucianism, it is now part of the landscape. However, I was not completely surprised to read in the local paper about a study that had found many local residents blamed Ashfield’s large Chinese population for what they saw as the town centre’s disrepair and unwelcoming atmosphere. Such ordinariness revealed the 'direct correlation between age, declining physical mobility and feelings of alienation from the "new" Ashfield'. Liverpool Road was the focal point of people’s anxiety and feelings of displacement, of being excluded. 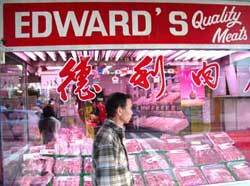 Resentment about the proliferation of Chinese shops with their incomprehensible signs was felt as much by the first wave of migrant residents as by elderly Anglo-Celtic residents. Rather than leave it festering, however, the findings became the basis for another study, also by the Social Inclusion centre, called Building Neighbourhood Community Harmony: Strategies for Local Government. With local initiatives being the big focus in anti-racism in Australia at the moment, the program will provide a toolkit of intervention strategies for local government in similar situations to consider, Wise says. Griffith in South Australia, chosen as an older multicultural suburb, and Western Australia’s Canning, as a typical outer suburb, are also in the program. With $98,000 from the federal government’s Living in Harmony program, Ashfield’s year-long project (due to end in June but with a possible extension) takes the search for “home and sociality” as its central point, emphasising place sharing, intercommunal relations and dialogue. Target groups are local residents, mainly the elderly, and Chinese shopkeepers. Although Ashfield Council’s local multicultural and ethnic affairs committee has helped to oversee the program, and community liaison officers and Macquarie University translation students are also involved, a new community harmony working group has elderly Anglo, Chinese and Indian residents as members alongside councillors and community representatives. Chinese seniors have visited a low-care Anglo retirement home, exchanged sweets and cakes and talked about their families. Other groups have had lunch at a local Shanghai restaurant, where they also learnt about the food’s cultural context. Shop signs are to be translated and displayed in English and Chinese. There will be Welcome Open Days to shops and restaurants, a Taste of Ashfield Cookbook, and a health and hygiene booklet (for the shopkeepers) including notes for preparation and display of food. Misunderstandings are gradually being cleared. Liaison officers are talking with Chinese shopkeepers about what to do when a non-Chinese customer walks in. 'While it may be polite in China to be brisk and efficient and not exchange in chat, Anglo customers felt that was rude. They want a "please" and "thank you", or "how are you today",' Wise says. 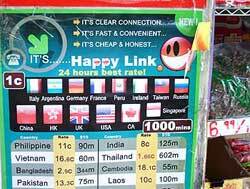 One of the biggest problems was the loud posters advertising cheap overseas calls. The Anglo population thought the posters degraded the area. It then turned out that the Chinese shopkeepers did not like them either. So the council has committed to a clean up. Focusing on the everyday also leads to greater trust. One Chinese woman after visiting the retirement home, announced she would stay in Australia to die and not return to China as she had planned. Growing old here did not frighten her anymore. Do you know Norton Street? I was born there in 1940!!! and we lived in one of those "Federation" houses!! till 1948. Bet the neighbours have changed...we learned to ride a bike together (his) at Christmas 1945. We both fell off. Is the little corner store with the stone steps still there? (one block off the tram line road, which went to Burwood, where I got free penny icecreams on V day at Coles; still remember that sick feeling the next day, 61 years on) Used to buy a penny worth of brocken biscuits in a brown paper bag once a month at the shop, with me pocket money, it was me pocket money!! !, and sit on the steps and share 'em with me mates. I'm on the way back to find out as soon as I can get a week off! Ashfield? My family and I love the place. We enjoy the diversity that oozes from it's pores and we enjoy the fact that we can still find fruit and vegetables that we have never seen before. The smiling friendly faces of the Chinese community and how they welcome us into their world. We feel safe here, we have never witnessed acts of violence that make us unsettled. We came here ten years ago after living in a huge Mcmansion out west to buy a wonderful Victorian terrace. We now call Ashfield home, and very proudly so. Oh and Frank, we live in Norton Street. Maybe we have the same home you once occupied in your early years. I am English born but now living in Shanghai (close to a place called little Shanghai) married to a Shanghai woman who speaks little English. Cultural differences play a major role in my new life, so your article was particularly interesting. I have never been to Australia, though I have relatives in Sydney and my wife has friends and relatives that have worked in Australia, so it is probably only a matter of time before we visit Australia. 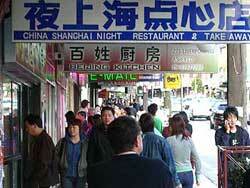 It will now be high on my list to visit 'Little Shanghai' in Sydney. I am well aware that even the best intentioned gestures can be abrasive because of differences in cultural expectations and customs.